The pens have erasable ink, so they are great for marking your comments/edits on a paper while reading. They erase via heat. Each pen comes with a plastic nub, and if you apply friction to the page with the plastic nub at the top, and it erases the writing --mostly clean. A word of caution though, this means if you leave your writing in a hot car, you will find it erased, which you can remedy by putting it in a freezer. I am not kidding. 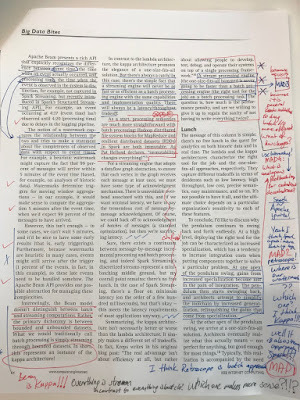 So, don't use it for writing you want to keep permanently, but it is great for writing comments and marking on a paper when you are reading. I print the research paper I am reading and I do a lot of marking on paper. If I use a regular pen, I cross over some of my guesswork, nonsensical questions, or misinformed comments, and it messes up the paper. But using Frixion pens, I erase and modify my comments without creating a mess. Well, at least, less of a mess. I am still not an online shopping junkie. Although these pens are available on Amazon, I still like to buy them from a store. I was happy to see that Walmart has the 3 colors (black, red, blue) for $5. 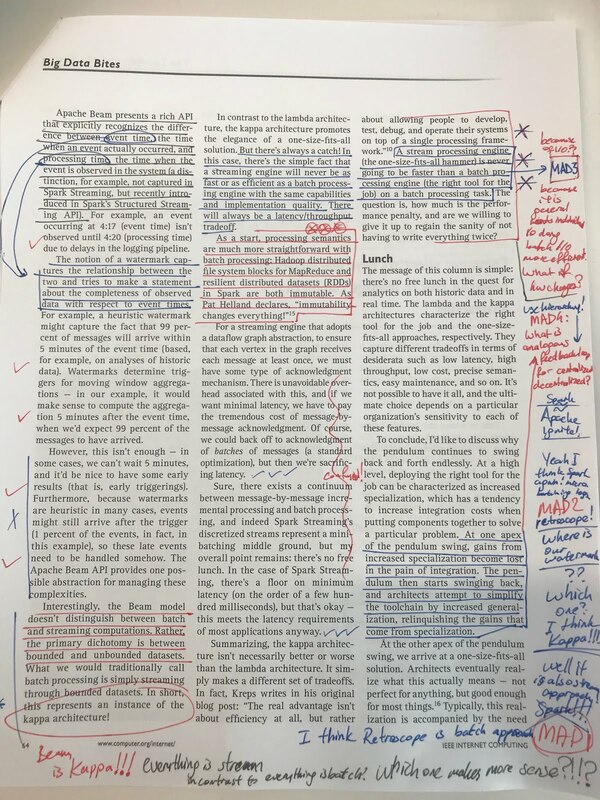 I use the red pen for question, blue pen for important comments, and black pen for all the other comments and doodling. I once prematurely advocated going back to the fountain pen. Then I reverted and said that, as much as I like writing with a pen, the productivity gains from typing and text wrangling in Emacs is unmatched. I still switch between the two. Mostly I live in Emacs happily. But I print and edit with erasable pens when I need to edit. And I switch to a fountain pen (a cheap Pilot Metropolitan pen combined with a refillable ink-pump --- again not advertising), when I am badly stuck and I need to think on paper, or when I want to break monotony. I sign things with that fountain pen, and the pen surprises the students even my colleagues. Fountain pens are now considered antique. I wonder if it would be possible to combine the perfect pen on paper feel with all the ease/convenience of text wrangling in Emacs within the next 10 years. I feel that would be the ultimate productivity product for me. No I don't think MS surface* is there yet; it is still lacking in both fronts: writing-feel and editing-convenience. I was hoping Apple with get there, but after Steve Jobs passed away, I am not counting on it anymore.